The Life Aquatic with Steve Zizzou is absolutely amazing. Plunged into a completely out of sync universe, you can really enjoy a story, which, whilst it is moving, doesn’t fail to deliver on humour. I really enjoyed the film, but above all I loved the soundtrack which mixes together different genres of music. As well as beautiful pieces performed by Sven Libaek’s orchestra, there’s also some Bowie revisited by Seu Jorge in Portuguese, some really simple but moving songs like The Way I Feel Inside by The Zombies and even that genious bit of music composed by Mark Mothersbaugh that I can never get out of my head! As simplistic as this shortcut can be, after listening to all that, yes I want to talk about fish. This recipe will never be as good as the film, but it’s still worth giving it a go! Begin by preheating the oven to 180°C. Then, wash the limes and tomatoes, cutting the limes into quarters and the tomatoes in half. With the onions there are two options: if you’re wearing contacts you can get stuck in and skip the next step, but otherwise if you hate chopping onions and you’d like to avoid this torture then listen up. Why do we cry when chopping onions? In short, because when we chop them the knife destroys the cells of this poor vegetable and enzymes are expelled into the air, which happen to be made up of a volatile substance, sulphur. Allium sulphate, in fact, which proceeds to attack our corneas. A vicious circle is set into motion: when the sulphate comes into contact with the water in our tears it gets turned into an irritant liquid so that basically the more it stings the more we cry and the more we cry the more it stings. Not cool. The reason I’m explaining this to you (yep, still on the same subject) is that I never had a problem with onions before chucking in my contacts for glasses! The secret, then, is to chill the onion before chopping (a few minutes in the freezer) or, simply cut the onion whilst running it under a little trickle of water. Not exactly practical if you need to chop the onion fine, but for this recipe you’ll only need long slices. Let’s continue! Make sure that your sea bream don’t have any bones left in them; or pluck them out with some tweezers. Mix together your ground salt, pepper and cumin and rub the fillets in the mixture until its nicely impregnated. 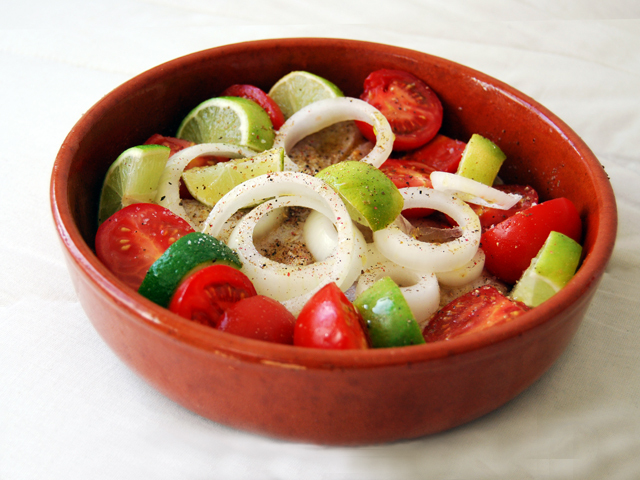 Next, in a dish big enough to hold all your ingredients, drizzle a little olive oil, spread it out well and start putting it together: first some onions, a pinch of the cumin, salt and pepper, then the fillets, some more onions, the chopped tomatoes and finally the quartered limes. A final pinch of cumin, salt and pepper, a drop of olive oil and it’s ready to be cooked. Before putting it in the oven, remember to cover with some aluminium foil. Place in the oven at 180°C (fan oven if possible) for ten minutes then take off the aluminium and leave to cook for 5 more minutes. The cooking time is changeable and depends completely on your oven. Check it regularly because I assure you, you won’t want to eat overcooked fish. 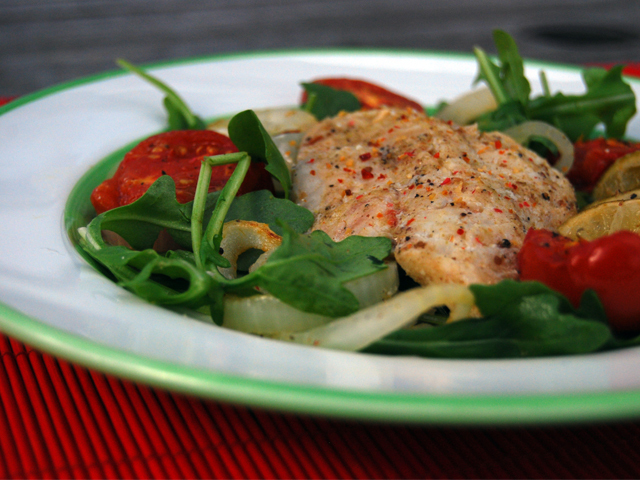 Serve on a bed of lightly seasoned rocket – why not balsamic vinegar.